Newegg.ca - Computer Parts, Laptops, Electronics, HDTVs, Digital Cameras and More! Free domestic ground shipping on qualifying items. Free shipping on returns and waived all restocking fee for qualifying items. Open box, clearance, refurbished and recertified PCs , electronics and more. A great blend of performance, features and quality, the MSI 990XA-GD55 AM3+ motherboard offers a solid base stone for your power house with everything you want and nothing you don't. AMD 990X chipset natively supports the AM3+ processors allowing you to make the most of the latest computing technology. Harnessing groundbreaking DrMOS technology, precise and robust power supply to the CPU is made possible even during demanding situation. Take advantage of Military Class Components for industry leading stability and reliability. Unlock hidden CPU core and potential with a simple press of a button via the OC Genie. Enjoy a great boost of system performance with USB 3.0 and SATA 6Gb/s. Lossless 24-bit/192KHz HD Audio, an excellent complement to the solid performance, push your experience to a new level with exquisite, immersive sound reproduction. Military Class II The perfect trinity of quality, stability and efficiency all exist at one mainboard to meet end user expectations. The MSI Military Class II series products provide the long lifespan, unparalleled quality, extreme performance and ultimate efficiency. Insisting on the best stability, MSI utilizes Hi-c CAPs on Military Class series. Made of the rare element Tantalum, often used on space shuttles and satellites, which sustains very high temperatures and shows an amazingly high electrical conductivity. The super Ferrite Chokes use a Ferrite core that is Super-Permeable. Compare with traditional choke, the Super Ferrite Chokes run at a 35 degree Celsius lower temperature. The lower working temperature will enhance mainboard stability. For providing the highest quality products, Solid CAPs are also built in the entire Military Class series. This not only makes bursting capacitors a non-issue but also ensures a dramatically extended lifetime and ultra-low ESR. DrMOS In order to provide customers stable and high quality products, starting from P45 series mainboards, MSI is leading the industry to introduce the world's most advanced power supply component, DrMOS (Driver-MOSFET), which integrates Driver IC, Top MOSFET and Bottom MOSFET into one chip. Except for its outstanding performance in power saving, DrMOS possesses switch frequency which is 400% faster than traditional MOSFET and has great improvement in stabilizing power supply and voltage control. Even under heavy loading and overclocking conditions, DrMOS can still provide the most stable and efficient power supply and quality. OC Genie II – Overclock & Unlock CPU Core in 1 Second OC Genie II, the most powerful and easy overclocking technology is implemented on MSI's AMD 9-Series mainboards. MSI's OC Genie II completely automates advanced overclocking functions and offers up to 248% higher performance with the simple click of a button. It does not matter if you're a first time hardware owner, or a veteran overclocker, activating MSI OC Genie II will unlock your hidden CPU cores, overclock your CPU and your memory to simply give you the best and stable performance for free on MSI AMD 9-Series mainboard available. APS (Active Phase Switching) Active Phase Switching, APS, technology is an intelligent design that helps to save energy on MSI’s mainboards. The underlying idea is to switch off the power supply as soon as no electricity is needed, and when the system needs more resources again, APS will automatically adjust electricity supply accordingly. APS will automatically detect your processor’s loading at any given time and save energy accordingly. This is only possible by means of a very advanced power controlling technology. Other than software-based solutions, APS technology stands out from MSI's own research. The specially developed IC chip can operate automatically depending on the demands of the power supply, which is to reduce the total power usage. USB 3.0 & SATA III Compared to the 480Mbps provided by traditional USB 2.0, the all-new USB 3.0's 5Gb/s offers 10 times the transfer bandwidth, so transferring a Blu-ray movie takes less than one minute. MSI also has implemented a front panel USB 3.0 port, making the use of an external USB 3.0 device even more convenient. SATA 6Gb/s provides double the bandwidth of traditional SATA 3Gb/s, and increases the data transfer rate between your mainboard and internal storage devices, such as 7200RPM HDDs, 10000RPM HDDs and SSDs. It’s also the current trend for upcoming high-speed internal storage devices to break the existing bottleneck of a PC’s performance. AMD CrossFireX & NVIDIA SLI AMD CrossFireX / NVIDIA SLI technology allow two or more discrete graphics cards to work in concert in one computer system for scalable gaming performance. With these technology, the traditional graphics limitation exists no more, bringing your gaming to a new level of smooth and realism. This item is covered by Newegg.ca's Standard Return Policy. Been running, sometimes for weeks, continually since August of 2012. Smooth install in a proper ATX case, no issues hooking up SATA cables. Have bought other MSI boards with Military Grade components since, all running smoothly. Cons: Wish I had switched from ASUS motherboards to MSI sooner! Other Thoughts: Highly recommend any MSI motherboard. I now also buy the MSI video cards, seems to run smoother than ATi. Thank you for sharing your experience with the MSI product! If you ever require technical assistance, please feel free to contact our technical support department directly at 626.271.1004 from M to F, 9am to 6pm Pacific Standard Time. Cons: -Sata ports are "sticky"
Other Thoughts: Had this board for 3 years now. No issues. Even accidentally stabbed it with a screw driver when installing Coolmaster 212 Evo. Only issue I've ever had was that it's a little difficult to reach the SATA cables without removing graphics card. Also the SATA cables grip pretty tight and it's given me some scares before but otherwise no actual issues. Pros: haven't had one hiccup from this board. Used by unsuspecting parents for mostly email facebook and skype but doing perfectly for 4 years. Pros: simple to setup ran great till now. Cons: Im going back to ASUS, they did not die on me, MSI did. Pros: This Mobo works fine for me. i use a water cooler and run 8 cores at 100% for a long time/ over night and have no problem. easy bios. What do i say I just put the computer together and that was it no need to open it up again. I seldom give 5 stars. i am seldom happy with a product. Pros: Quick set-up with an easy to use overclock interface. Read everything plug and play after assembling. Other Thoughts: Great motherboard with a 4 year warranty. Benchmarks don't run as well as they should on my video card because of PCI 2.0 but when I'm playing I cannot tell the difference. 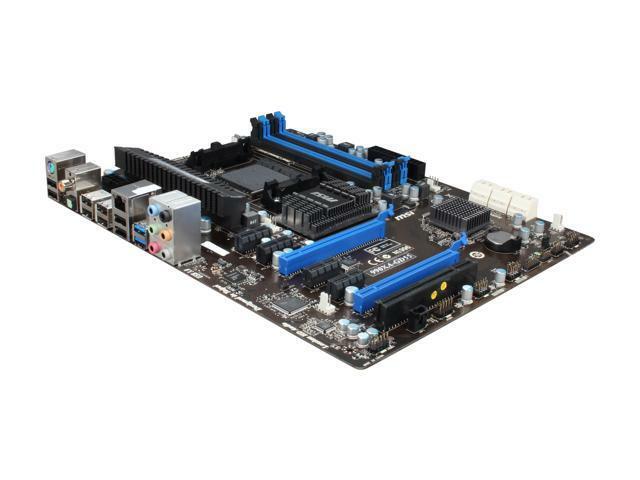 Pros: Motherboard is a very nice board with high end components, I found them very stable. You need to have experience when building like setting your ram up at bios to proper speed if its over 1333 mhz ram and then the rule of thumb is to boot up with one stick of your matched ram first and then add a stick at a time on reboots. And also going over 1866 ram at least with an AMD cpu is pointless because thats the highest most of the cpu's support to ram connection anyway up to a 4.2 ghz cpu which is the average user builds.. Overclocking may be a different story but most overclocking isn't for an every day user and I recommend avoiding it. Cons: Didn't see any, and like I said overclocking can usually safley and correctly only really harvest a bout .2 or .3 over most cpu's if you notice when they say turbo mode that means the cpu will run that cause they tested it but probably will be unstable past that, hence not worth even turboing or overclocking IMO. Other Thoughts: I've built a few of these and have had no problems, if you learn what your doing so you recognize if there really is a problem or if you perhaps forgot to set something correctly or in the wrong order you shouldn't either. Enter your email address to agree to receive promo codes from Newegg. You can unsubscribe at any time. © 2000-2019 Newegg Inc As used herein, “Newegg.ca” means Newegg Canada Inc. unless the context specifically refers to the www.newegg.ca web address.